Dow Filmtec SW30XLE-440i or equivalent, 8"x40, 2 No. (60Hz/120V/230V/460V) 15Hp, 3 Phase, TEFC. or (50Hz/ 220V/380V) 15Hp, 3 Phase, TEFC. High grade material and high pressure rating piping are used in ForeverPure® reverse osmosis systems. This ensures extremely safe operation of all ForeverPure® reverse osmosis systems. The most effective way to prevent calcium carbonate scale formation is to lower the feed water pH via the injection of an acid. The acid will convert bicarbonate ion into carbon dioxide. One metering injection systems will be supplied for controlling different elements in the feed water of the RO plant. The metering pump will allow controlling of different functions such as the stroke length and percentage rate. The Chemical Dosing System prevents membrane from scaling. Multimedia filter is designed to make better use if the bed depth in the removal of a greater volume of suspended solids. This is achieved by loading larger media granules of lower density at the top of the bed, with at least one layer of smaller media granules of higher density below it. The larger granules remove the larger suspended particles, leaving the smaller particles to be filtered by the finer media. 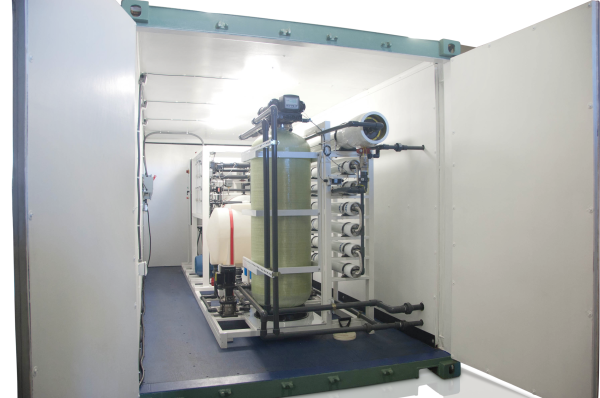 Depth multi-media filtration system is used to filter sand and sediment (turbidity) down to approximately 20 Microns. Automatically backwashes when filter is clogged. Saves replacement filter cost. Corrosion resistant, high performance composite & fiberglass tank will be used to hold the media. 16"x65", 1. No.